Welcome Cruise Shippers to our Roatan South Shore Canopy Tours! 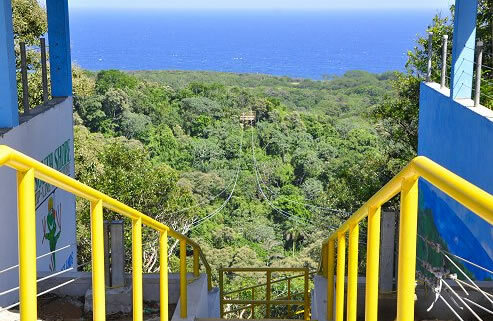 When you go to Book Online you will see other popular mix and match tours such as the Zip line tour + Walkway + Beach. When you reach your cruise ship terminal and exit the boat, please look for the South Shore Canopy Booth or Tour Guide. Your South Shore Tour guide is waiting for you. Your tour includes round trip transportation to and from the cruise ship dock in our air conditioned, 14 passenger vans. Our drivers and guides are English speaking Islanders who are very knowledgeable about the Island. Please CLICK HERE for DIRECTIONS to the South Shore Canopy Booth/Tour Guides from your cruise ship terminal. We suggest that you Print the Directions for both the Mahogany Bay Cruise Center and Town Center/Port of Roatan Cruise Ship Terminals. That way if your ship docks at either terminal due to last minute changes you will be prepared and we will be ready to pick you up! Whether you are just stopping by South Shore Canopy Tour or selecting one of our 4-5 hour packages below, join us for Roatan zip line fun, amazing South shore views, beautiful beaches and a dip in the crystal clear waters of the Caribbean. The famous and fun Zip and Dip Tour includes the South Shore Zip Line Tour and a Dip in the Caribbean at Roatan's white sand beach. This is a around a 4 hour tour. You will be picked up at the cruise ship dock in an air conditioned, 14 passenger van and returned safely in plenty of time for your departure. This tour is for individuals, couples, family's and groups seeking a thrilling adventure zipping through Roatan's jungle and swimming in the crystal clear waters of the Caribbean. This tour is for anyone over the age of 5 and in moderate physical condition. So, don't let your age or ability keep you from having a great time! 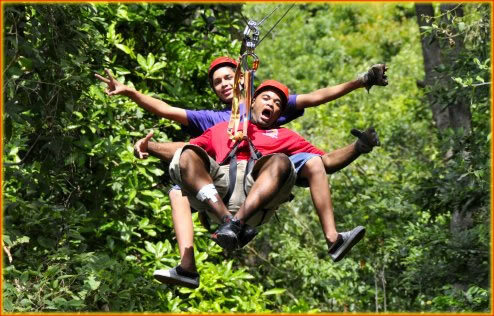 Enjoy the scenic views of Roatan as you travel to the South Shore Canopy Zip line. Your tour guide speaks English, so feel free to ask him any questions you may have during the tour. There is a changing area and restroom at your location. The Zuperman Zip and Dip Tour offers you an amazing flight over the jungle towards the sea in a special harness designed for flying like Superman and a visit to Roatan's most beautiful white sand beach for lots of sun and fun! Remember to Bring: Sun Lotion, bug repellant, bathing suite, towel, camera, and credit cards or cash for souvenir, drinks, and tips. There is a changing area and restroom at each beach location. The tour includes round trip to and from the cruise ship dock. Enjoy the scenic views of Roatan as you travel to Roatan beaches. Your tour guide speaks English, so feel free to ask him any questions you may have during the tour. The Eco Walkway and Beach Tour offers you an amazing walk through the jungle over suspesion bridges and a visit to the beautiful West Bay Beach to enjoy the warm sun, white sand, clear turquoise colored water, and snorkeling if you choose. At Beachers there are fabulous tropical drinks, delicious food and sea food platters, cold beer, best fries, best price and soda for the kids, and it is just steps from the water. Thanks for choosing South Shore Canopy Tours for your Roatan Vacation Experience.